The concept of graceful labeling of graphs has been extensively studied. In 1994, Mitchem and Simoson introduced a stronger concept called super-edge-graceful labeling for some classes of graphs. Among many other interesting pioneering results, Mitchem and Simoson provided a simple but powerful recursive way of constructing super-edge-graceful trees of odd order. In this note, we present a stronger concept of “tight” super-edge-graceful labeling. Such a super-edge graceful labeling has an additional constraint on the edge and vertices with the largest and smallest labels. This concept enables us to recursively construct tight super-edge-graceful trees of any order. As applications, we provide insights on the characterization of super-edge-graceful trees of diameter 4, a question posed by Chung, Lee, Gao and Schaffer. We also observe infinite families of super-edge-graceful trees that can be generated from tight labelings. 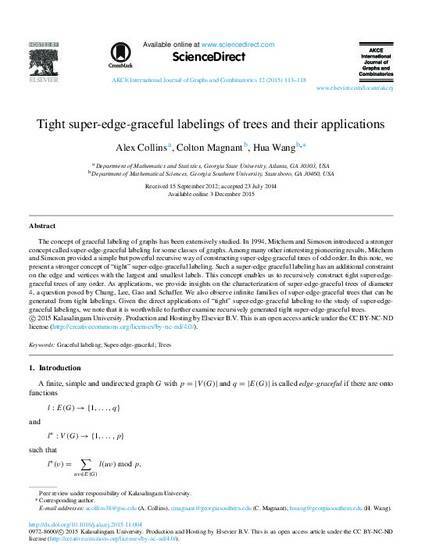 Given the direct applications of “tight” super-edge-graceful labeling to the study of super-edge-graceful labelings, we note that it is worthwhile to further examine recursively generated tight super-edge-graceful trees. © 2015 Kalasalingam University. Production and Hosting by Elsevier B.V. This is an open access article under the CC BY-NC-ND license (http://creativecommons.org/licenses/by-nc-nd/4.0/). This article was retrieved from the AKCE International Journal of Graphs and Combinatorics.